Find Those Caribbean Sailing Charters Which Meet Your Exact Requirements! or at a price you can afford. This isn't an uncommon scenario, but there is a better way of chartering a sailboat in the Caribbean. You just need to change your approach. But let's take this a step at a time. You've already made your first choice; you've decided on the Caribbean as your charter destination - and a very good choice it is too. But you need to narrow it down a bit. A good point to consider here is where you can get a direct flight to from your home airport. If you're flying from the UK for example, you can get direct flights to Grenada, St Lucia, St Martin (or St Maarten) and Antigua, all of which are excellent destinations for a Caribbean sailboat charter holiday. Other island destinations may require either a ferry or an inter-island flight which will take time out of your vacation. For example, to my knowledge there are no direct flights from the USA or Europe to the Virgin Islands, one of the best Caribbean sailboat charter destinations of all in my opinion. But perhaps the sheltered sailing among the paradise islands that make up the British Virgin Islands (the BVI's) or the American Virgin Islands (the USVI's) is well worth the additional cost of an inter-island flight from St Martin - plenty of charterers would agree with you. The next thing you'll be thinking about is, who's going with you? Say for example there'll be three couples, so you're going to need a 6 berth charter yacht with at least three double cabins. This will be fine if you're taking a bareboat charter (where you take full charge and responsibility yourself), but if you want a skippered charter then the skipper will also want a cabin to himself. Then there's the type of boat. A monohull or a catamaran? Maybe, if I dare mention it on this sailboat website, a motorboat? There's much to be said for a catamaran for a Caribbean Sailboat Charter - more accommodation for boat length, no rolling at anchor and ability to drop the hook in shallow water close to the shore. The usual argument against choosing a catamaran is their additional berthing costs in marinas, but as you're most likely to either drop anchor or pick up mooring out here in the Caribbean, marina charges won't be an issue. When Can You Get Away? The high season in the Caribbean is the winter, January and February being the peak. But school holidays may be a consideration, so that may mean a summer trip when prices may be lower. 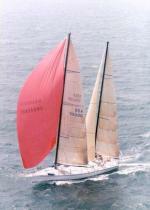 Racing sailors may wish to charter a bareboat monohull to enter into one of the Island Race Weeks. Antigua sailing week - normally in late April - is a favourite with many crews.